On this date in 1902, the Jewish socialist Hirsh Lekert was hanged in Vilna (Vilnius) for his attempt on that city’s governor. The 22-year-old shoemaker, active in the Bund since childhood, was aggrieved along with many others by repressive measures taken against that leftist council by Vilna governor Victor von Wahl — culminating with the calculated humiliation he inflicted by personally overseeing the flogging of 20 Jews and 6 Poles arrested at a May Day demonstration. As was the style at the time, Lekert took some retaliatory potshots at the municipal dictator on May 18, 1902. He scored a couple of flesh wounds before the police on hand beat him all to hell. And that was pretty well that. Lekert got sent to face a military tribunal with a foreordained result. But he made his bones with posterity by refusing to apologize and instead fearlessly vindicating his action as a defense of the Jewish worker’s dignity. This carried his legend in the early 20th century Jewish community much further than one might assume. 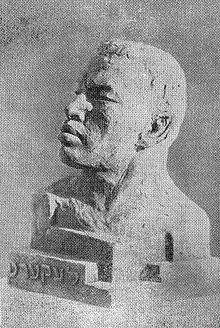 For Jewish Workers Bund, “the first great attempt at the organization of the Jewish masses for secular and independent political activity,”* Lekert’s uncompromising embrace of revolutionary violence created an internal controversy: radical workers saw a martyred hero; elites, and the Bund officially, were much more wary of terrorism provoking official backlash in an empire where Jewish communities were still liable to be targeted by pogroms at any time. All this during a renaissance of cultural and political thought among Eastern European Jewry. Even decades later, the esteem remaining Lekert from his sacrifice gave his name power. Another generation of Jewish terrorists — in Mandate Palestine — was incensed at the British for flogging some Irgun members, leading Menachem Begin to invoke Lekert as his justification for kidnapping several British soldiers and flogging them. (Source) The British had no stomach for this, and desisted with floggings. And from the hellish Vilna Ghetto under Nazi occupation, the great poet of the Holocaust Abraham Sutzkever depicted his “Teacher Mira” trying to keep her students’ heads up by reminding them of the Vilna cobbler who fought back. Mira must not reveal the darkness thus. About Hirsh Lekert, how he fought and fell. * Koppel Pinson, “Arkady Kremer, Vladimir Medem, and the Ideology of the Jewish ‘Bund'”, Jewish Social Studies July 1945.